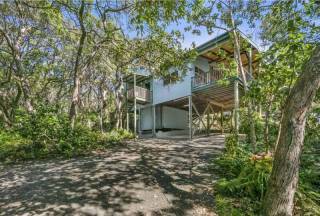 Ideal for the budget conscious and walking distance to Cylinder Beach. Centrally located, comfortable and great value. Easy walk to beaches, post office, hotel, shops and convenience store. Perfect for families looking for a peaceful place away from the traffic. Swing, slippery dip and see saw. 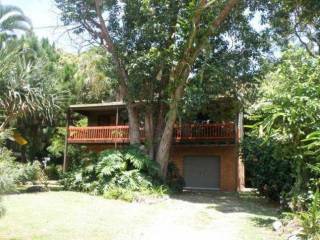 Adjacent to bush walking track and nearby sand boarding dune. 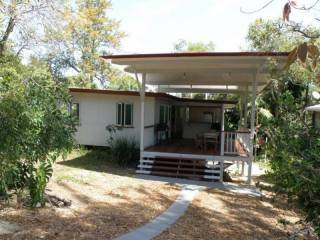 This 2 bedroom downstairs unit, with bushland views, is ideal for people wanting a central location in a quiet part of Point Lookout. 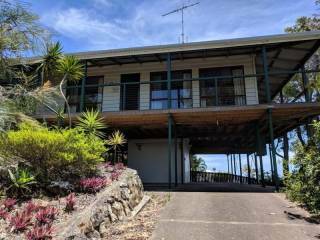 Located within walking distance of popular Cylinder & Home beaches, bus stop, Point Lookout Hotel, post office, convenience store, takeaways, shops and sandboarding hill. Kitchen is fully equipped with dishwasher, microwave, fridge/freezer, electric stove/oven and plenty of cupboard space. The property is tiled throughout and has a security screen door. All bedrooms and living areas have ceiling fans. All windows are screened. Contains a TV/DVD/STEREO, 2 extra pedastal fans and 2 heaters. The huge bathroom with spa bath has a hideaway laundry area with washing machine, dryer, iron etc. The patio area with table, 6 chairs and 2 banana lounges overlooks a bush setting. A separate covered barbeque area sits nestled in the garden providing privacy and a sense of tranquility with surrounding bush reserve. This area contains another outdoor setting for 6, 2 BBQ's (gas & wood), sink, stereo, ceiling fan and an extra fridge. Our resident kangaroos, goannas and abundant bird life are testament to the peaceful atmosphere. Just the place to sit and have a beer whilst watching the kids play on the swing, slippery dip and seesaw. Birdhaven is a very peaceful and comfortable place to visit. Great for family holidays (with entrance ramp for prams) but also ideal for couples. Birdhaven is non-smoking accommodation.